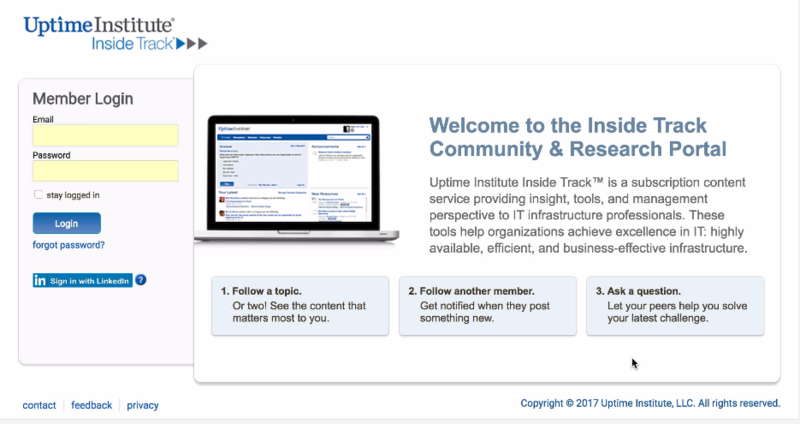 Inside Track is the online community for Uptime Institute’s Network membership. It is a real-time communications portal which enables industry leaders from all over the world to share ideas, gain experience and solve real-world challenges by learning from each other. Membership is limited to end-users and consumers of critical infrastructure technologies and provides the industry’s only dedicated unbiased knowledge repository. Online community members also gain access to exclusive Uptime Institute Research infrastructure reports, expert opinions on a wide range of selection, deployment and optimizations topics from a diverse population of industry peers along with a wealth of polling and benchmarking information to help our members better understand how their organization’s performance compares with those of their peers and other similarly situation organizations from around the world. Fill out the contact form below and someone from our member support services team will follow up with you right away. We will contact you soon regarding Inside Track.